BRANTFORD – Wilfrid Laurier University’s Brantford campus is opening its doors this weekend and inviting community members to stop by for an Open House. The event, which begins at the Carnegie Building at 10 a.m. on Saturday, Oct. 1, will kick off with a welcome reception followed by guided tours. Tour highlights will include the Brantford Games Network Lab, Expositor Place, the Indigenous Circle Room, and a chance to see some of the artifacts unearthed at the Laurier-YMCA construction site. The event is free and everyone is welcome to attend. 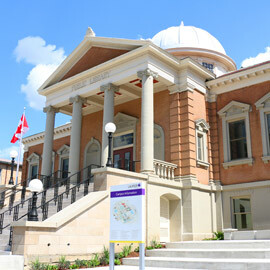 Laurier’s Brantford campus now occupies over 20 buildings in the city’s core, and has over 3,000 students. In determining which spaces to include in the tour, organizers say they opted for a combination of the innovative and the nostalgic. The tour will also include a stop at the SC Johnson Building, which was formerly a Bank of Commerce. In this space, a selection of artifacts from the Laurier-YMCA site will be on display, and representatives from Archaeological Research Associates Ltd. will be on hand to answer questions. Artist’s renderings of the new Laurier-YMCA facility will also be on display. Following the tours, guests will be invited to gather for refreshments at the Research and Academic Centre (West). Laurier staff and faculty will be on hand to answer any questions, and guests will have the chance to have their photo taken with Laurier’s Golden Hawk mascot.